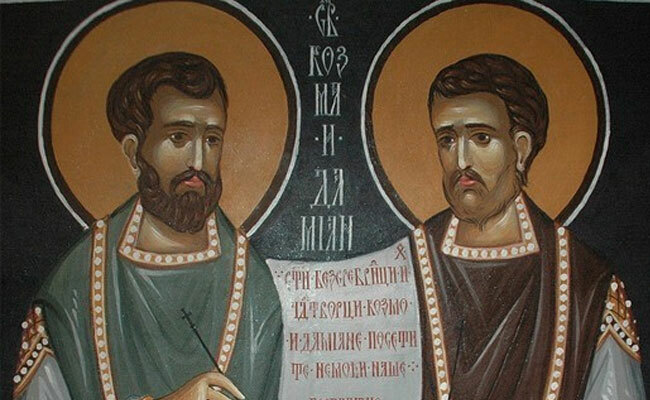 Serbian Orthodox Church celebrates today the feast dedicated to Cosmas and Damian, popularly known as “Vraci” or “Vracevi”. These saints are considered patrons of the medical profession. Feast of Saints Cosma and Damian is celebrated today in churches of the Serbian Orthodox Church, Orthodox homes and many health facilities that hail these saints as protectors of their profession. Saints Cosmas and Damian were twin brothers, physicians, and early Christian martyrs born in Cilicia, part of today’s Turkey. They practiced their profession in the seaport of Ayas, Adana, then in the Roman province of Syria. The did not accept payment for their services, and many believe that this is how they attracted many people to Christian faith.